Dave Hopkins, Managing Director of the TTF, in new podcast on sustainable timber. 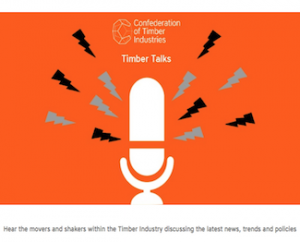 The second in the series of podcasts produced by the Confederation of Timber Industries has just been released, featuring Dave Hopkins, Managing Director of the Timber Trade Federation talking about sustainable timber. He discusses sustainability, certification and procurement with Andrew Carpenter, Chief Executive of the Structural Timber Association. This follows the first podcast in the series, in which Andrew Carpenter discusses the Value of the UK Timber Industry with Roy Wakeman, Chair of the Confederation of Timber Industries.